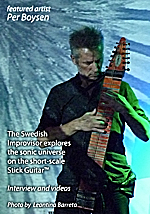 Instrumental music by Per Boysen for electric string instruments in orchestration. Big thanks to Emmett Chapman and Tim Donahue for inventing and building magical music instruments! On this solo album I’m playing the 12-stringed Chapman Stick Guitar on most pieces, quite a lot NS 5-stringed Cello, some Steel Guitar and Fretless Harp Guitar. For the sparse string orchestra sweetening I want to thank the guys behind Spitfireaudio.com and LA Scoring Strings. 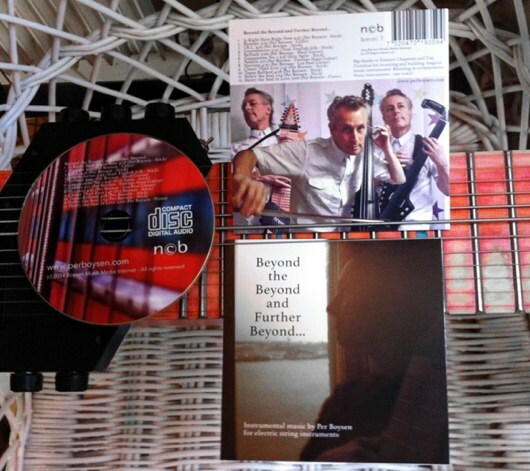 CDs available at Stick Enterprises, BandCamp, CD Baby and some other places. Downloadable digital formats available at BandCamp, CD Baby and iTunes. This low price cello model was designed by Ned Steinberger, that used to make guitars before. It doesn’t use electro magnetic pickups, like the Stick and electric guitars do, but some other construction that offers the player to flip a switch to optimise the tone pickup for bowing vs finger plucking. I use both ways of playing in these recordings. My NS cello is the five-stringed model. This is a wonderful music tool! A fretless ebony board neck with six strings and also six freely twanging harp strings. Both 6-strings groups have EMG electro magnetic pickups and may drive two different amplification rigs, if you like it that way. The harp side does in fact have one ”fret”; if moving away your left hand from the fretless neck you can push down any harp strings towards the fret to raise the pitch by a half note. What makes this harp guitar different from traditional harp guitars is that the harp- and neck string groups are tuned in the same octave (traditionally harp guitar’s harp strings are bass strings). Doubling notes for a unison sound or plucking close clusters are techniques I love also on the Stick Guitar. Mine is the Dusenberg Fairytale lap steel model that has two levers that will let you soar into those classical country licks without having to deal with the monstrous pedal steel guitar. I use a heavy steel on the strings which initially felt a bit awkward compared to the feather light glass-slide-on-finger treatment I’m used to give my vintage style Stratocaster. Not much to say about this one, I guess. My oldest premier instrument now used on only one track out of this album. I still love guitar but use it quite rarely these days. You know, sometimes it just sounds so… guitar-ish that it almost kills the music.